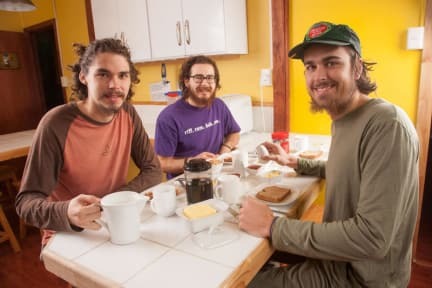 Come to live the experience The Singing Lamb Hostel in Puerto Natales. 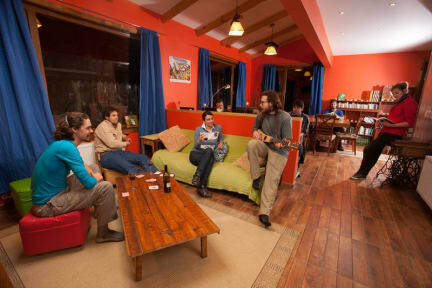 The Singing Lamb Hostel is a very complete and comfortable place to stay before and after your touristic activities. We offer free WI-FI, bar, spacious leisure areas , rent of lockers, laundry and a store with local handicraft. The house is centrally heated and is always warm. Our newly renovated kitchen is at your disposal throughout the day, though we will make breakfast for you, with homemade bread, homemade jams and cereals, all included in our price! There is a large dinning and living room for you for having breakfast and relax, read or just sit with friends to organize your next destination. It includes multiple couches and chairs, and 3 computers. As you already know, we have two dormitories for 9 people each, a 6 bed dormitory and 9 private rooms with their own bathroom, you can choose a double bed (matrimonial) or twin beds when you do the booking for this private rooms. All rooms incluide towels. If you are Interested in restaurants, we can recommend you the best restaurants and bars in town. We'll help you to organize all aspects for your stay in Patagonia. We can sell you bus tickets to Torres Del Paine & Calafate and other tours to beautiful destinations. Interested in excursions and one day activities? We can organize boat trips to the Glaciers, a visit to a Patagonian estancia for horse riding, a full day Torres del Paine tour, which includes the Milodon Cave, and the famous trekking to the base of the Towers. Our aim is to make you feel at home and to provide you with all the local information you need. Our staff is formed by local professionals from Puerto Natales and they can speak English.